Please note "Ke Dil Abhi Bhara Nahi" Natak occurred in past. 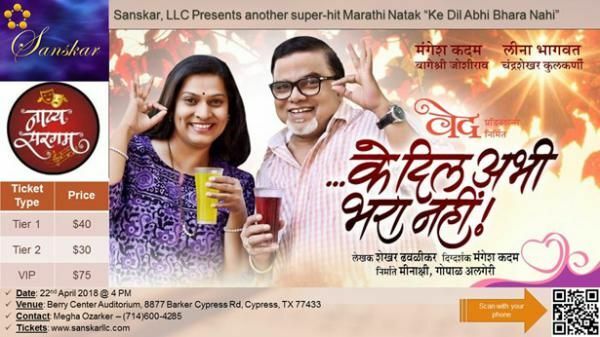 After the massive success of "Sakhar Khallela Manu Natak" in 2017, Sanakar, LLC has organized "Ke Dil Abhi Bhara Nahi" Natak staring "Mangesh Kadam, Leena Bhagvat, Chandrashekhar Kulkarni, and Bageshree Joshirao". You can find more information and buy the tickets at the following link. Natak will start at 4:00 PM on 22nd April at Berry Center Auditorium.